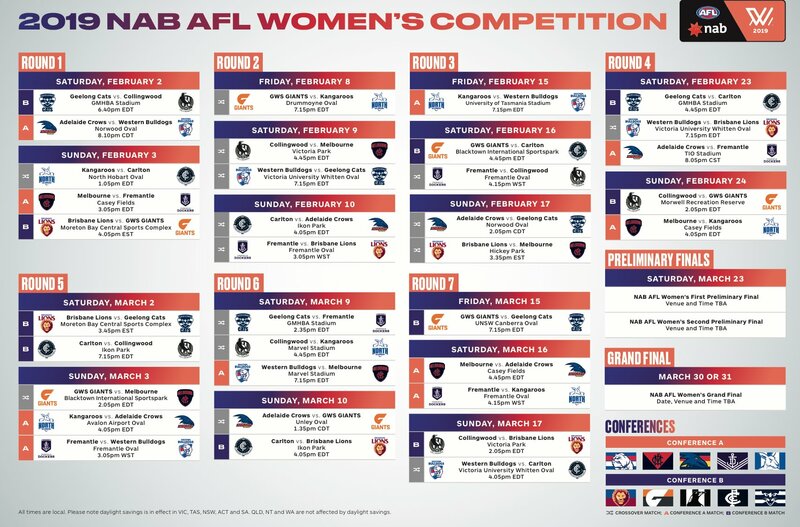 The AFLW fixture and conference break-up has today been released ahead of the 2019 season. As expected, it will be a seven-round competition, followed by two weeks of finals. Geelong and North Melbourne enter the competition this year, with Geelong granted the season-opener against Collingwood at GMHBA Stadium on February 2nd. North will open their campaign the next day against Carlton in Hobart. The Pies will play games at both Victoria Park and Marvel Stadium. The highest seed of conference A will play the runner-up of conference B and vice versa, with the two winners meeting in the Grand Final.